On Saturday 02 June, I joined the Auckland Architecture Association (AAA) for a sold out site tour around Patterson Associates’ new commercial development in Parnell. The project, which is nearing completion, is called Geyser and is the latest in a series of cloud themed buildings from the practice. Geyser follows on from Cumulus, also in Parnell, and Anvil on Dominion Road, which was the winner of the 2012 NZ Architecture Awards for Commercial Architecture. Geyser shares much of the thinking that has been seen in Patterson’s previous Cloud buildings; namely that they respond to the needs of medium sized, boutique, businesses while providing unique and well detailed solutions to often challenging sites. The buildings’ conceptual cloud origination references a sense of belonging to a New Zealand identity and this approach is continued in Geyser. The buildings facade patterning, for example, derives its rhythm from the fronds of a Maori cloak. But the strongest tie-in to a regionalist architectural identity is created by the way that the building has been designed to respond to Auckland’s light and climate, achieved by employing a floating twin glass facade interspersed with super smooth GRC fibreglass reinforced concrete panels. Built on a tight urban site on Parnell Road and surrounded by a mix of commercial and residential buildings, Andrew Patterson, who led one of the tours, described how the project’s conceptual generation came from its plan. The idea started from the reworking of a rectangle that was sliced three times and disassociated to create five separate buildings grouped around atriums and courtyards. The project offers three floors of office space and a ground floor set aside for retail and restaurants, with movement between buildings via interconnected walkways and stairways. There are also plazas on two of the development’s corners. Geyser makes a visual impact in the way that the five buildings hover tightly together at the top of Parnell Rise. There is a real lightness to the way that they sit on the site and the drama of the spaces can already be seen despite the site being surrounded by all the usual paraphernalia of fences and building supplies. Once inside, the office spaces are bathed in a soft bright light and privacy between buildings, and clients, is maintained by the mist like opacity of the facade. Both interior and exterior detailing is similarly refined. Construction on Geyser started in 2010. The developer, Samson Corporation Ltd, had specified that tenant operating costs should take precedent and Patterson’s approach put the buildings’ efficiency at the heart of the Geyser design process. 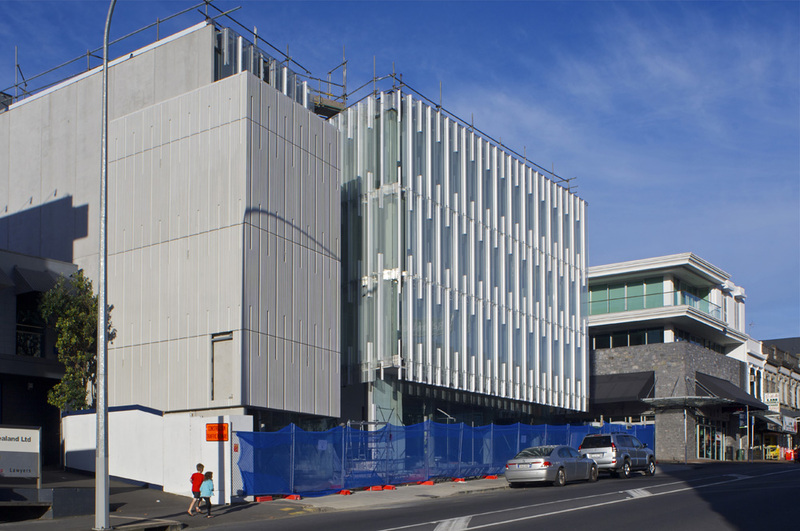 The project was subsequently awarded a New Zealand Green Building Council (NZGBC) rating of six stars at the design stage, making it the first office new build of such a standard in New Zealand. Two factors are central to Geyser’s efficiency. The disassociation of the five buildings and the use of atriums and ventilation shafts has meant that there is strong natural light penetration throughout all of the buildings. As a result, Geyser is set to use half the amount of artificial lighting compared to similar sized commercial developments. The buildings’ facades are also key to moderating internal temperature and providing natural ventilation. Geyser’s twin skin, glass facade allows for a great amount of control over heating and ventilation. The external facade is computer controlled and linked to a series of sensors that monitor meteorological conditions such as temperature, rainfall and wind speed. 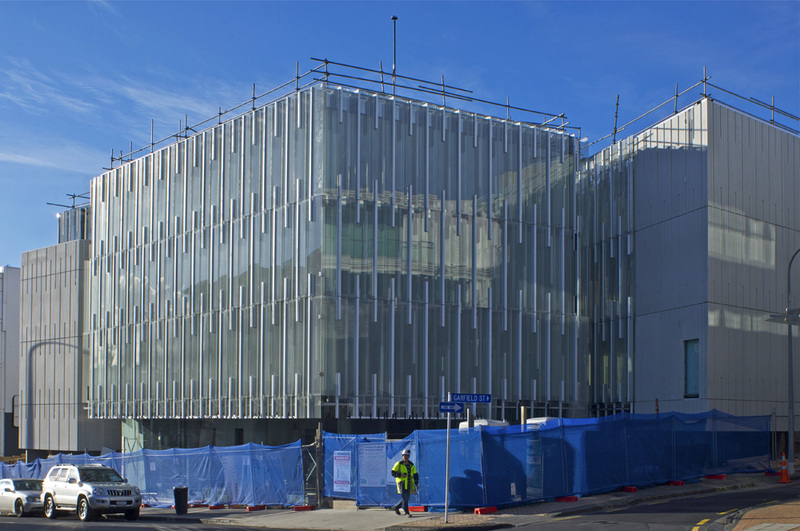 Depending on the time of the year and prevailing conditions, the facade can be set to open and close to maximise thermal convection currents. During colder periods the space between the skins keep the building warm and in summer air flow can be directed through the voids of the facade and between the northern and southern facing walls. Manual control has been kept for the interior facade to allow for a greater level of fine tuning by the buildings’ inhabitants. One other major component of the build that will contribute to the overall efficiency of Geyser is the automatic car stacker that is being installed in the basement levels. The stacker will be able to park vehicles with an extremely precise automated system which uses four turntable booths, a trans-elevator and a shuttle system for placing cars into the underground parking spaces. Geyser’s six star NZGBC rating has already seen it receiving favourable press coverage. But the way that the building has been constructed is a also well worth a mention. The two big major components of Geyser are the facade and the automatic car stacker. Both were fabricated in China and are being assembled by Chinese workers here in Auckland. The facade for Geyser was designed and manufactured by King Facades and provides a model which could significantly influence the future of architectural development in New Zealand. King Facade NZ Ltd is a joint venture between Richina and King Facade in China (the Shen Zhen King Facade Decoration Engineering Co. Ltd). It is now widely recognised that some of the major advances in building technologies are being developed in China, from high tech facades through to prefabricated building systems. The fact that this technology is being used in Geyser’s construction provides a great example of how creative and technological experimentation could, and should, influence how we build our cities in the 21st century. The dovetailing of an urban vision, influenced by the likes of Patterson Associates and Samson Corp, with the technological and industrial abilities of China could have a real impact on the future urban fabric of Auckland and New Zealand. GEYSER AAA site tour 02.06.12 from David Cowlard on Vimeo. The tour of Geyser was the first in a series of three AAA site tours organised for 2012. The next two tours are set to visit the St. Heliers Development with Cook Sargisson & Pirie and the ASB Business Building, Wynyard Quarter, with BVN Architecture & Jasmax. Details of other projects by Patterson Associates are available from the Architecture Archive at Auckland University.